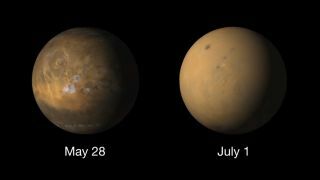 Images of Mars taken on May 28 and July 1 of this year show a global dust storm completely obscuring the planet's surface. NASA's Curiosity Mars rover noticed this summer's monster dust storm fairly early on — but not in the way you might expect. The storm was first spotted from above by NASA's Mars Reconnaissance Orbiter on May 30 as a localized event near Perseverance Valley, a landform being explored by the agency's Opportunity rover. Those signs were temperature readings, made by sensors on a motor on the car-size rover's deck, mission team members said. That motor powers the lid on a funnel that directs powdered rock samples from Curiosity's drill into its onboard chemistry-lab instrument, which is known as Sample Analysis at Mars (SAM). "All my charts showed the dust storm effect on the actuator because it's exposed; it's sitting out there on the rover deck," Benito Prats, an electromechanical engineer at NASA's Goddard Space Flight Center in Greenbelt, Maryland, said in a statement. "All of a sudden, I saw the daytime temperature drop really quickly." A look at the temperature-measuring motor (or actuator) on Curiosity's deck, which operates the lid to a funnel that helps direct samples from the rover's drill to its onboard Sample Analysis at Mars (SAM) instrument. This is a still image from a short video taken in January 2011 in the clean room at NASA's Jet Propulsion Laboratory in Pasadena, California, by SAM lead mechanical engineer Oren Sheinman before Curiosity was shipped to Kennedy Space Center in Florida for launch. The nighttime temperature stayed abnormally high as well, as it does during big Martian dust storms: While all that dirt in the air blocks sunlight during the day, it also prevents infrared radiation from escaping to space at night, keeping things warmer than usual after the sun goes down. The storm continued to grow, eventually encircling the planet by June 20. Its intensity plunged Perseverance Valley into perpetual darkness, blocking so much sunlight that the solar-powered Opportunity couldn't recharge its batteries. The golf-cart-size rover, which has been exploring Mars since January 2004, hasn't made a peep since June 10. The motor's temperature measurements helped the Curiosity team keep tabs on the storm (which they also did using the rover's onboard weather station). And Prats combined the dust-storm data with historic readings from the motor, to predict when the storm might start clearing up. "At sol 2,125 (July 28), I noticed a linear trend," Prats said, "so I said, OK, I can predict that sol 2,180 (Sept. 23) is going to be when we're going to get out of the dust storm and the temperature will return back to normal, though I later updated that to sol 2,175 (Sept. 18)." That forecast proved accurate: Dust levels in Gale Crater had returned to normal by Sept. 18, according to the motor measurements, NASA officials said. The skies over Perseverance Valley have cleared as well. Indeed, Opportunity's handlers began stepping up their attempts to hail the silent rover on Sept. 11, kicking off a 45-day "active listening" campaign. If this effort fails to rouse the rover, the team will assess its next steps, NASA officials have said. Opportunity mission leaders have said that they'll keep listening on a passive basis at least through the end of January, however. Scientists are eager to study all the data they can about the recent Mars dust storm, to get a better handle on these fairly regular, but poorly understood, events. For example, researchers can't accurately predict when a global dust storm will arise on Mars, and they don't know why some small storms balloon into planet-girding monsters, whereas others fade away. "I can estimate, two years in advance, the temperature, air pressure, and whether there's going to be dust or clouds in the air during the non-dusty season anywhere on the planet," Scott Guzewich, an atmospheric scientist at NASA Goddard who leads Curiosity's dust-storm investigation, said in the same statement. "But during the dusty season, in locations that have dust storms, I can't give you any prediction at all that there will be a dust storm on one day and not another."